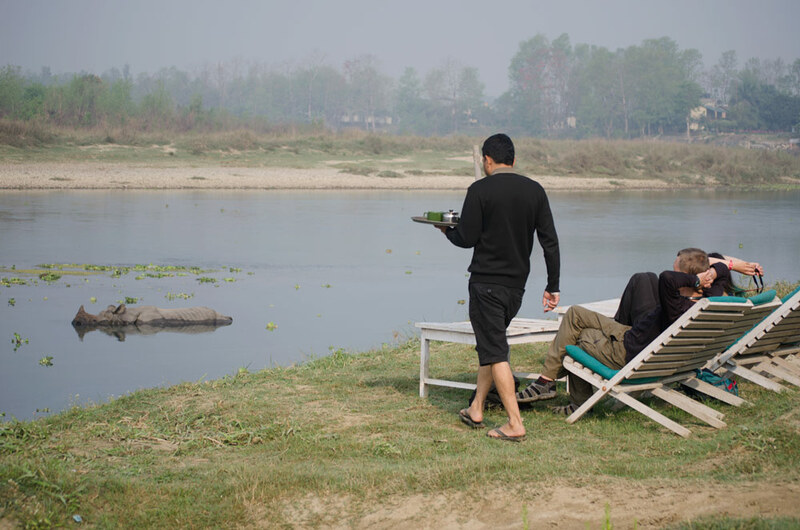 Earlier this week I rose to a fresh, peaceful Sauraha and decided to head down to the riverside for an early coffee. To my surprise, just a few meters in front of me was a huge Greater One-Horned Rhinoceros. I took the table directly opposite it and for the next two hours watched and photographed this fascinating creature bathing (and continually farting) in the Rapti River. The well known Rhino begins to stir in the early morning. 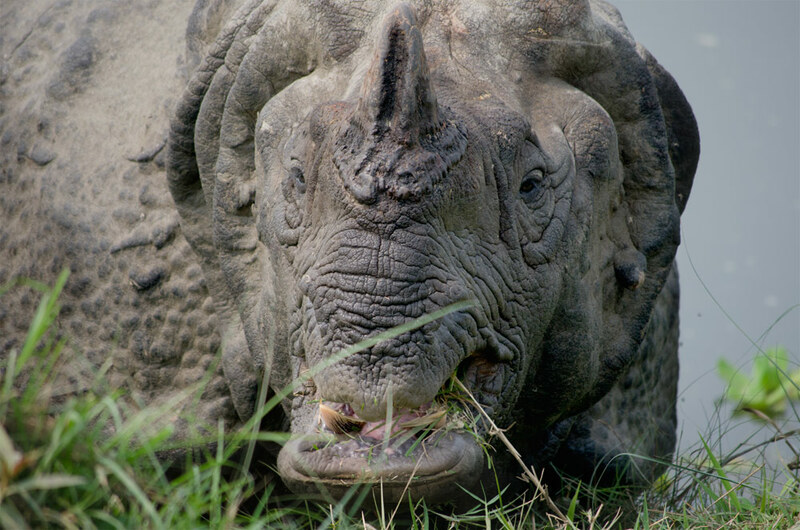 This Rhinoceros is native to the Indian Sub-Continent and is currently classified as a ‘vulnerable species’ on the IUCN Red List. 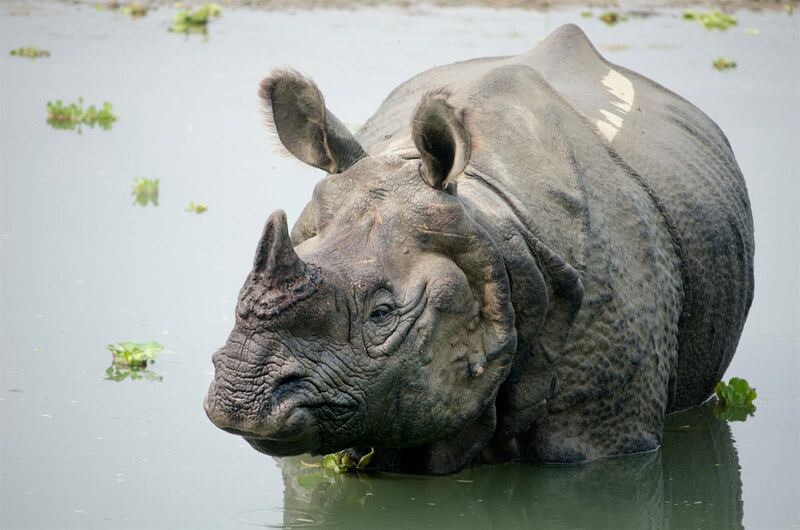 It is widely considered that the species’ decline is due to human encroachment on the creature’s vital habitats of alluvial grassland and riverine forest, notably in the 1950’s when impoverished farmers moved from the mid-hills to the Chitwan area in search of fertile land. Illegal hunting also made a huge dent in the population of this Rhino, an issue which has been largely addressed with the stationing of Army Posts throughout the National Park. In 2002, however, it is said that 32 of these precious Rhinos were killed by poachers who used methods such as strangulation, entrapment and shooting to win their prize; the horn of the Greater One-Horned Rhinoceros. Positively, however, the number of Rhinos have shown great signs of increase with the current estimated figure for 2015 at 645 animals, compared to a distressingly dismal 95 animals in the 1960’s. Gingerly, the Rhino emerges from the water. The turbulent cycle of this Rhino’s population figures made me feel very fortunate to see one naturally bathing in the wild and I felt even more fortunate to be sitting no more than 10 meters away, casually sipping on a coffee whilst doing so. I eventually peeled myself away from the strangely graceful hulk of an animal to meet my guide. It was him who told me about this nameless Rhino (perhaps the ceremonial naming of a stray/wild animal is more of a Western phenomenon as I have met many a dog, cat… and rhino here with no name). Tourists order tea and relax in deck chairs watching the sleeping Rhino. He’s about 30 years old, in terms of a Rhino’s expected life span of around 50 years, he may be considered as ‘getting on a bit’. Apparently its quite normal to see him on this spot of the river, bathing closely to the locals and tourists. I am told that because he is old, when he ventures into the depths of the Jungle he is chastised and bullied by the younger, more nimble Rhinos. 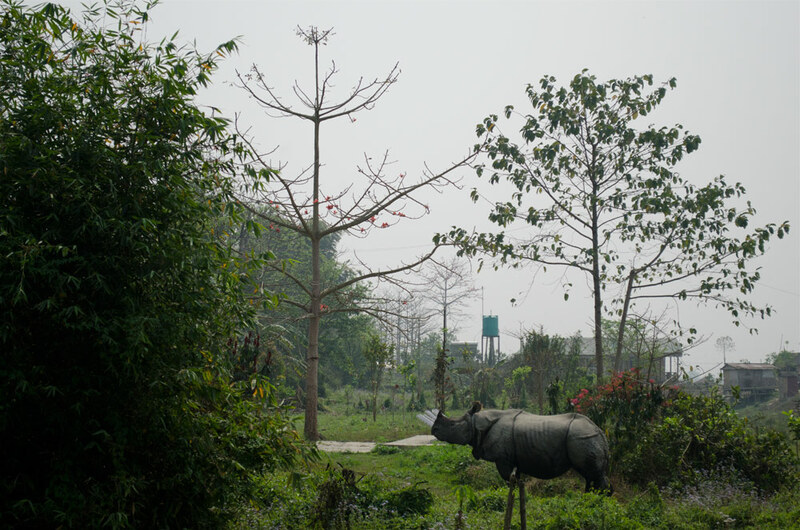 So, as a form of protection, he stays close to the humans of Sauraha where other Rhinos rarely venture. He takes sanctuary here, cooling off in the river’s relaxing current just a stones throw from my hotel. Getting ever closer, the Rhino exits the water and begins to graze just a couple of meters in of me. His huge, hulking, grey form took on a completely new character to me as I began to feel for this wild animal just as you would for a small child being bullied in the school playground. Such anthropomorphism can be dangerous and just a few hours later, when the unnamed Rhino decided he was done bathing and wanted to explore the cafes and hotels along the riverside, the extent of his inherently wild nature came flooding back to me as I nervously backed away from his advancing progress. The small group of both locals and tourists who had gathered retreated quite rapidly too and soon, probably unbeknown to the Rhino, he had complete control of the peoples whereabouts as they clumsily stepped backwards onto safer ground. 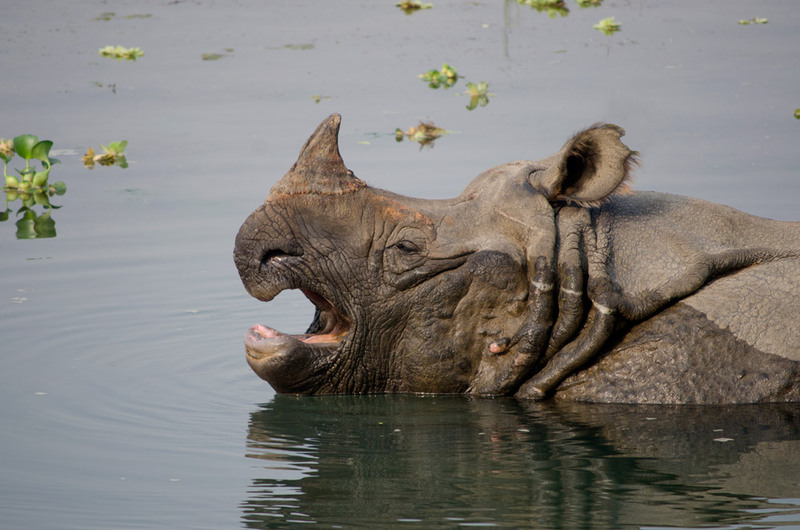 This Rhino and his wildness will always be a vivid memory from my trip to Chitwan. Hi Bikal, Thanks for checking out the website and also for the positive feedback on the blog. Its great to hear that you enjoyed the writing as well as the photographs. My best, Nia.